The manual-focus Milvus range offers all-metal dust- and splash-proof construction, large rubberized focus ring, smooth manual focus control, as well as engraved focus distance and depth-of-field scales. Announced in September 2015, the $1199 Carl Zeiss Milvus 1.4/50 ZE Canon (Milvus 50mm f/1.4) is an EF-mount Canon lens designed specifically for full-frame Canon DSLRs such as the EOS 5DS R. The fast f/1.4 maximum aperture makes it an excellent prime for low-light photography, with the versatile 50mm focal length suitable for portraits, street photography, and general use. 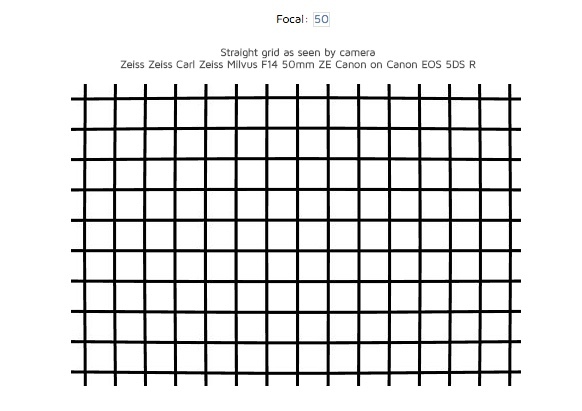 The Milvus 50mm f/1.4’s aperture range runs between f/1.4 and f/16, with a minimum focus distance of 45cm. Optical construction utilizes 10 elements in 8 groups; the lens measures 97mm in length, weighs 922g, and has an 82mm screw thread for attaching filters. As mentioned, there’s no manual focus, nor image stabilization, but the Milvus range electronically couples with your DSLR to record lens data to the EXIF file. The Milvus 50mm f/1.4 is also compatible with Canon APS-C sensor DSLRs, such as the EOS 7D Mark II, on which it offers an equivalent 80mm focal length, making it a useful short-telephoto portrait lens, although the focal length is getting a little long for much general-use photography. 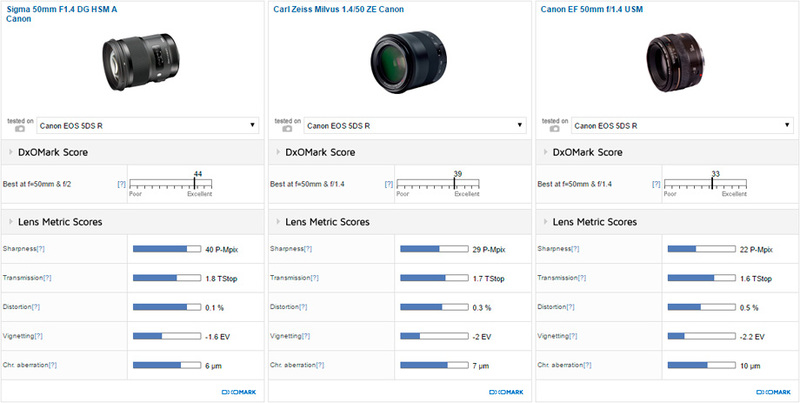 Good low-light performance, achieving an overall DxOMark score of 39 points, puts the Milvus 50mm f/1.4 in second place for 50mm primes we’ve tested on the EOS 5DS R. This places the Milvus option ahead of all iterations of Canon 50mm lenses in our database, as well as ahead of older Sigma and Zeiss 50mm options. The Sigma 50mm f/1.4 A remains the king of 50mm lenses for Canon shooters, but more on that later. The Milvus 50mm f/1.4’s highest overall sharpness score of 29 P-Mpix is achieved on the 50.6Mp 5DS R, but the Zeiss lens actually realizes more of the sensor potential of lower-resolution chips such as the 30.4Mp EOS 5D Mark IV, on which it scores 25 P-Mpix for sharpness, and 19 P-Mpix on the EOS 1D X Mark II, where it maximizes almost all of the 20.2Mp total resolution. On the 5DS R, the Milvus 50mm f/1.4 delivers excellent resolution at all aperture settings, with outstanding uniform sharpness of around 80% acutance in the field using apertures between f/2.8 to f/8. Using the wider f/1.4 and f/2 apertures, resolution isn’t quite as strong, but it is still very good, particularly in the center of the frame, with just a little edge softness creeping in. The small amount of barrel curvature (0.3%) would benefit from some post-production correction for perfectly straight lines, but even without it, distortion is minimal and not too concerning. Noticeable vignetting of –2 EV at f/1.4 and –1 EV at f/2 isn’t surprising when shooting with such wide apertures, but the Milvus 50mm f/1.4 is free from corner shading using apertures between f/2.8 and f/16. Chromatic aberrations are also well-controlled, with any fringing in the center and outer field well within the acceptable 5 to –5 micrometer range, and any noticeable fringing restricted to the far corners. Head-to-head against the Sigma 50mm f/1.4 A, the Sigma wins for almost all lens metrics, with just fractionally lower light transmission. Despite that, the Sigma 50mm f/1.4 A outperformed the Milvus in our low-light tests, achieving an overall score of 44 points, which is one of the best scores in our database. The Sigma lens is ahead for sharpness, too, scoring 40 P-Mpix, which realizes more of the 5DS R’s 50.6Mp resolution, compared to 29 P-Mpix for the Milvus. At the wider f/1.4 and f/2 apertures, the Sigma offers an improvement in sharpness, with slightly increased resolution in the center and less drop-off in the corners, but both lenses are very good. At mid-range apertures between f/2.8 and f/11, again, both lenses are very sharp, with high levels of acutance right into the corners, but the Sigma is fractionally sharper between f/4 and f/8. The almost 25-year-old, but still available Canon 50mm f/1.4 USM represents the budget option, and is a much smaller and lighter unit compared to the modern Art and Milvus lens designs, which feature a greater number of lens elements. 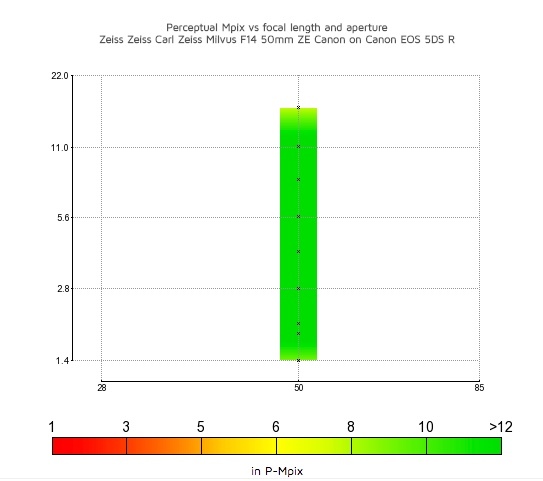 The Canon lens offers its best resolution between f/5.6 and f/11, where it comes quite close to the resolution performance of the Sigma and Milvus alternatives. It isn’t as good at the wider aperture settings, however, with relatively weak resolution at f/1.4 and noticeable edge drop-off. The Canon lens also displays more lens artifacts, with greater barrel distortion and more vignetting and chromatic aberration at the wider aperture settings. 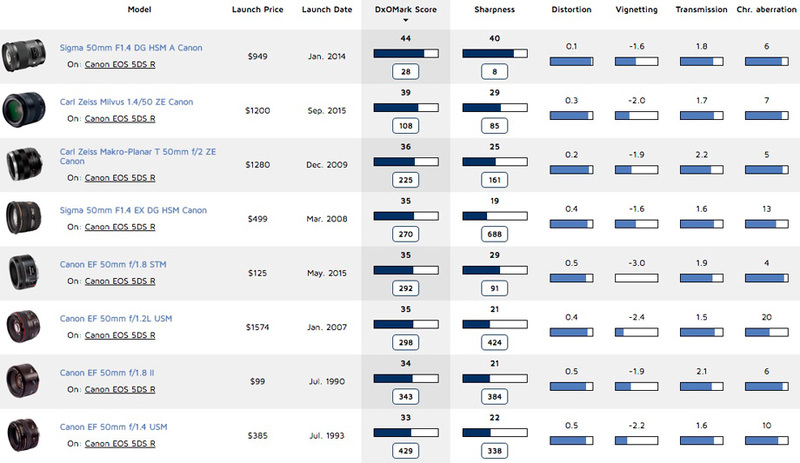 The Sigma 50mm f/1.4 A scores slightly better than the Milvus in these categories, too, but the scores are very close, and in terms of real-world image quality, we can say they’re essentially the same. Boasting an irreproachable reputation for quality, Carl Zeiss lenses have long been the desire of many a photographer. Historically they’ve often been out of financial reach of many of us, unfortunately, but the new Milvus range looks to address that with some competitively-priced models that challenge the high-performance optics from both own-brand and third-party manufacturers. 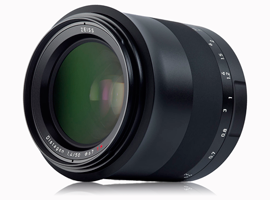 Featuring all-metal construction, manual focus, and Zeiss precision engineering, the Milvus 50mm f/1.4 is the type of lens that should last a photographer a lifetime. Performance is very good, with excellent low-light results, consistently good edge-to-edge sharpness at all apertures, and minimal distortion. Accordingly, the Milvus 50mm f/1.4 ranks above all iterations of Canon’s own-brand 50mm options that we’ve tested. For greater insight into the performance of alternatives to the Carl Zeiss Milvus 35mm f/2, please see our EOS 5DS R, EOS 5D Mark IV, and EOS 1Dx Mark II best lenses reviews.